Readers may have seen an article in last Sunday’s New York Times entitled “Soil Power! The Dirty Way to a Green Planet.” (1) In the article, contributing writer Jacques Leslie reports on new findings in the field of Regenerative Agriculture, specifically regarding the ways in which regenerative agricultural practices can sequester carbon in the soil. We all know that the buildup of carbon in the atmosphere is a major contributor to climate change. There are increasingly active studies on methods we can employ to sequester carbon to mitigate the effects of climate change. As Mr. Leslie reports, Soils comprise one of the Earth’s five major storage pools for carbon, the others being: Air, Oceans, Forests and Fossil Fuel reserves. In this context, Soils are one of the most promising areas for carbon sequestration, and Regenerative Agriculture is one of the best ways to store carbon in the soil over the long term. There is other encouraging news – Organic agriculture is one of the best farming systems for capturing and storing carbon in the Soil. A recent study, directed by The National Soil Project at Northeastern University in collaboration with the Organic Center, demonstrates that Organic ag. systems have superior ability to sequester carbon. (4) The study shows that the components of carbon-storing humic substances – fulvic acid and humic acid — were consistently higher in organic than in conventional soils. 1. Climate change is a threat to our future. 2. 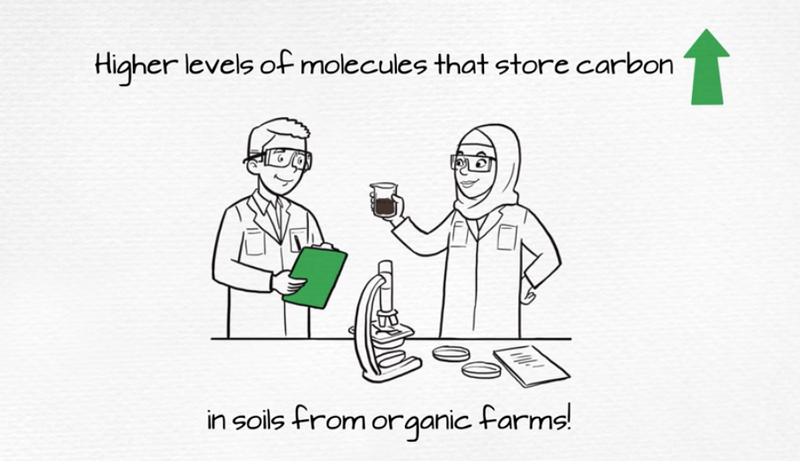 Carbon sequestration in the Soil is key to mitigating climate change. 3. Regenerative agriculture helps to sequester carbon in the Soil. 4. Organic agriculture and organic practices are particularly effective in carbon sequestration and building long-term soil health. The challenge of climate change is creating a catalyst for innovative solutions. Regenerative agriculture and organic practices show significant promise in the effort to build a more stable and sustainable future. That’s something we can all Dig. Older PostTop 25 Poll and Power Rankings - - for Veggies !